Vikri Beach Resort is a 46-room seaside compound with an actual beach bar centrepiece. Ad Book now! Rates from US$26.01++. Average rating 7 from 267 reviews. Surrounded by plenty of tall shade trees and a view of the sea, they have a variety of rooms to suit everyone from the solo traveller to families. The resort has developed slowly over time, with quaint wooden bungalows as well as not-so-quaint cement dwellings both in the mix; whichever you choose, the location is the real attraction here. Standard rooms are quite basic with ensuite bath, TV, air-con and small private verandas, with the separate villas being the more attractive options space wise and aesthetically. Not much in the immediate area as far as restaurants or shops are concerned, but a 10-minute motorbike ride in either direction will cover that. 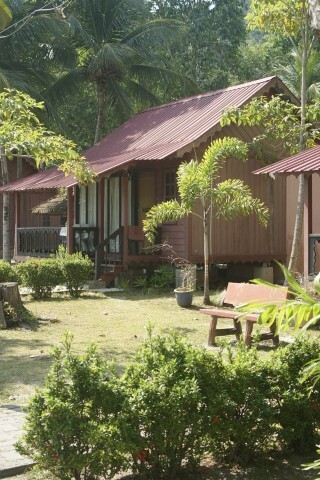 Check rates at Vikri Beach Resort on Booking.com.